We will not go quietly into the night! We will not vanish without a fight! We’re going to live on! We’re going to survive! Today, we celebrate our Independence Day! The 1996 film, Independence Day, is one of my favorite movies ever. Many people think I’m crazy when I tell them this, so I have dubbed it my “guilty pleasure” movie. I watch it at least once a year, on July 4th – and I usually end up watching it a few more times throughout the year, as well. Obviously, I was excited to hear about Independence Day: Resurgence, set 20 years after the original. I took myself to see it last weekend, and believe the 1996 version was better. That’s not necessarily a bad thing – in fact, I think it is a great comparison for the general atmosphere in the USA. One of the main complaints people have about the original movie is that there is no emotional depth. I disagree. The way the movie was filmed, showing only snippets of the many character’s stories, was extremely well done and true to real life. If the events of the War of 1996 were actually happening around you right now, you would not get to know every single emotion that the people around you were feeling… you would not get to see every moment, or know any backstory. While watching the movie, you are drawn in, given just enough information to be able to fill in the blanks about what the people around you have been through, and made to focus on the story that they are all a part of at that moment. The actors all had great chemistry, and the way the stories all connected by the end was cheesy, yes, but extremely well done. The 2016 movie has also been said to lack emotional depth – which I agree with. The special effects may have been more spectacular due to our advanced technology, but the chemistry between characters was barely detectable, and the story snippets that you are given are not genuine – just awkward dialogues, jokes, and hints that are obviously forced between the action sequences. How does this compare to the USA? It is a country that is about freedom and liberty for all, with the most “patriotic” of its citizens taking pride in being “the best” – and yet we have not been “the best” for many years. Nowadays, this country is shallow and unable to follow our own principles. We attempt to hide our shortcomings under a fancy, action-filled facade – unsuccessfully lying not only to foreigners, but to ourselves. We, the People of the United States of America, have always been passionate about our country’s freedom, but nowadays, that passion has been lessening. We are showing other countries a fake, shiny facade, full of action and explosions that everyone would rather focus on. We should not be this distracted away from the well-being of our fellow citizens and the land we inhabit. Luckily, there have been some great political revolutions and movements gaining momentum as of late. I’m optimistic that things will start looking up – just as I am hopeful that the next sequel set up for us in “Resurgence” will live up to it’s origins. 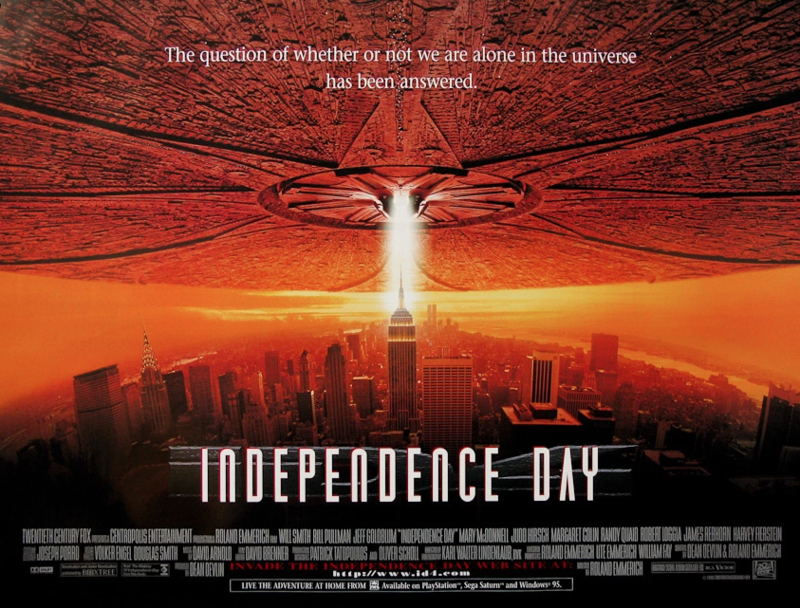 Today is Media Monday (brought to you by this blog’s Alliterative Agenda) as well as Independence Day 2016 in the USA! Celebrate by lighting a victory cigar and watching some fireworks with your friends.